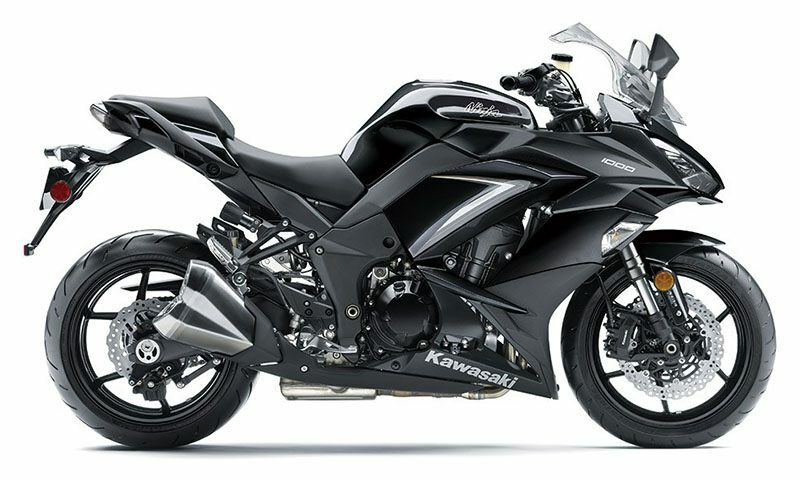 Modern aggressive styling with sharp and edgy lines makes it unmistakably Ninja®. The ultimate sport tourer infused with superbike technology makes it the Ninja 1000 ABS motorcycle. 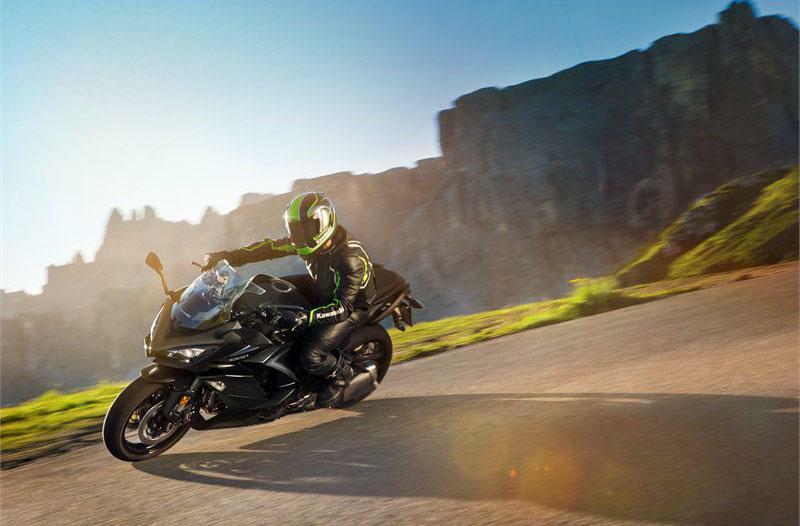 From the daily urban commute to back roads and 2-up touring, the Ninja 1000 ABS offers open-class thrills, everyday comfort and enhanced touring performance. ALL-DAY COMFORT: 5-position clutch lever can be adjusted to suit the size of the rider's hands based on rider preference. Wider seat for the rider provides greater support and comfort while the longer, more thickly padded passenger seat helps prevent the passenger from sliding forward, providing enhanced comfort​. Ergonomically sculpted passenger grips are easy to hold and naturally positioned. Adaptable, relaxed upright riding position is comfortable and optimized to accommodate a full range of riding situations​. EVERY-DAY CONVENIENCE: Mirrors are positioned 20 mm farther outward and have a greater range of movement, offering easier adjustability. Digital display meter adds a gear position indicator, shift up indicator lamp and needle, LCD screen negative display, air temperature gauge as well as indicators for the IMU and KIBS. Clean-mount side case system allows KQR side cases* to be attached and removed easily for added convenience. DC power outlet (knock out) in dash area enables the addition of a DC power outlet to power devices/accessories. *Sold separately as Kawasaki Genuine Accessory. 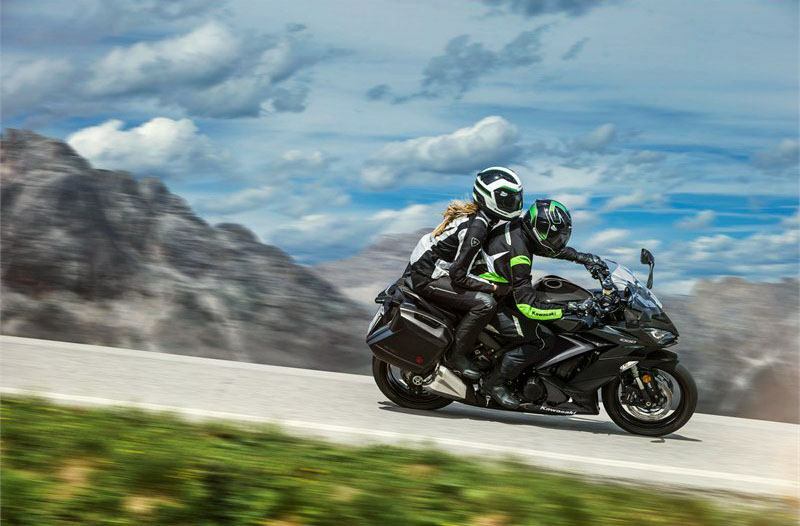 POWER & HANDLING: Take on the streets with legendary Ninja performance. ASSIST AND SLIPPER CLUTCH: Assist and Slipper clutch offers light clutch pull and minimizes rear wheel chatter caused by downshifting. FRAME: Aluminum twin tube frame is highly rigid and features a high degree of mass centralization ensuring a balance of sharp turning and firm handling. SUSPENSION: Horizontal monoshock with stepless rebound damping and remote spring preload adjusts to suit riding conditions and rider preference. Revised shock settings and linkage ratio offer suppler suspension action for improved bump absorption and firmer cushioning. 41 mm inverted cartridge fork with stepless compression and rebound damping plus adjustable spring preload. 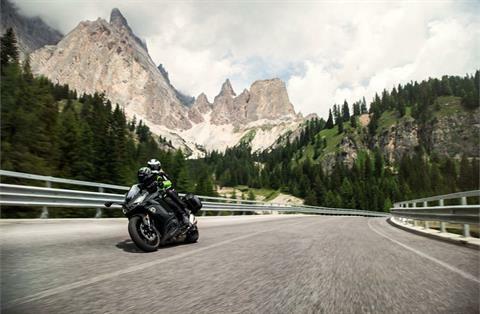 BRAKES: IMU enabled Kawasaki Intelligent anti-lock Brake System (KIBS) is a supersport-grade high-precision multi-sensing ABS brake assistance system. Rear brake pads for increased response. ABS rear brake features a single 250 mm petal-type rotor with single-piston caliper. ABS front brakes feature dual 300 mm petal-type rotors with radial mount 4-piston monobloc calipers. SHARP NINJA® STYLING: Front and side fairings with harder, sharper and edgier lines provide modern styling and improved wind protection. Chin spoilers similar to those on the Ninja H2 and Ninja ZX-10R models strengthen the resemblance. 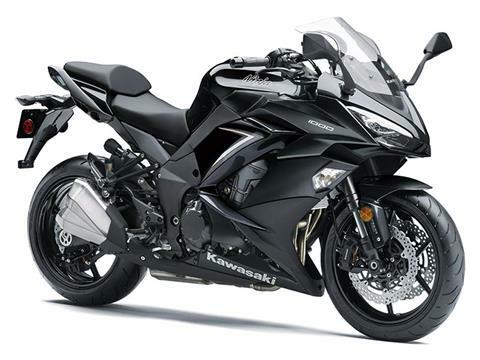 Front and rear turn signals are more integrated, contributing to the modern updated sportbike image. Dual LED headlights are lower profile and feature low and high beams that offer excellent brightness. BOSCH® IMU ​(INERTIAL MEASUREMENT UNIT): Compact IMU enables inertia along 6 Degrees of Freedom to be monitored. Acceleration along longitudinal, transverse and vertical axes, plus roll rate and pitch rate are measured. 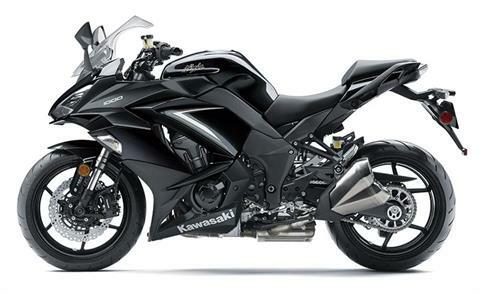 The yaw rate is calculated by the ECU using Kawasaki’s proprietary dynamic modeling software. This next-level system enables predictive and adpative electronics for precise chassis orientation awareness. KAWASAKI TRACTION CONTROL (KTRC): Whereas many competitive traction control systems react to wheel-slip, this IMU-enhanced feedback version of KTRC predicts conditions and acts before slippage exceeds the range for optimal traction. The KTRC system features 3 modes, allowing riders to choose the degree in which each mode assists during riding. Riders may also elect to turn the system off. KAWASAKI INTELLIGENT ANTI-BRAKE SYSTEM (KIBS): Kawasaki’s supersport-grade high-precision multi-sensing brake management system. 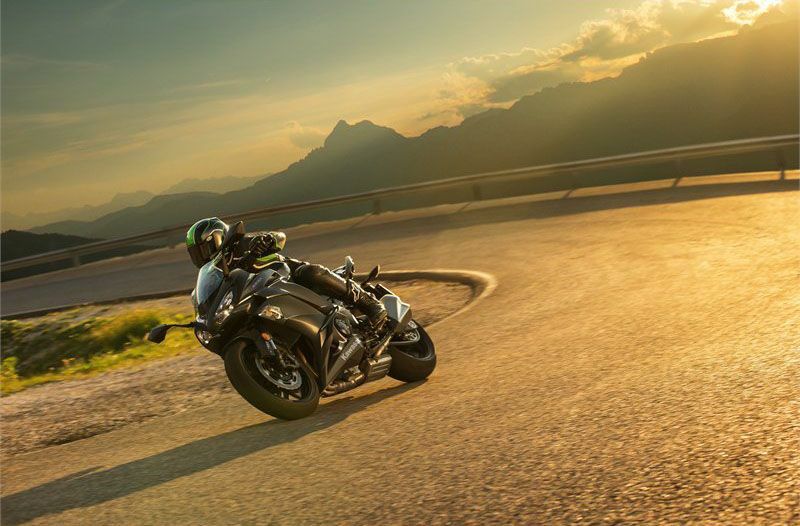 Uses high-precision control to modulate brake pressure for highly-efficient braking with minimal intrusion during sport riding. 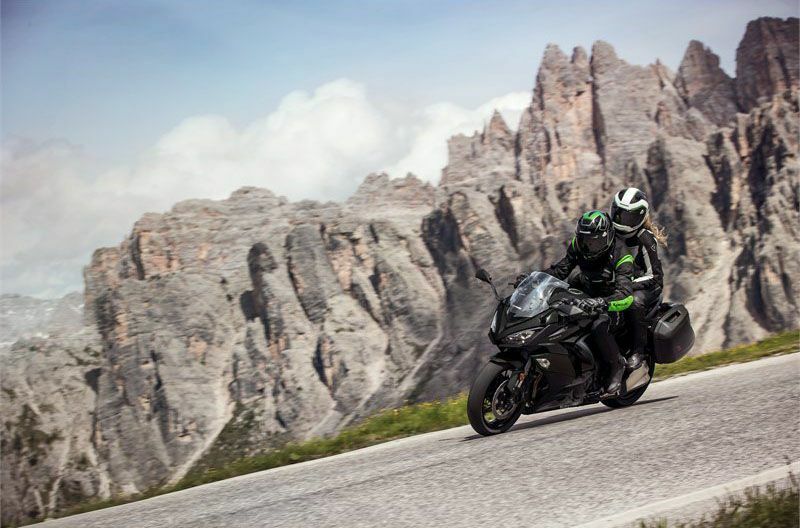 KAWASAKI CORNERING MANAGEMENT FUNCTION (KCMF): Input from the IMU enables a control function: cornering management, which monitors engine and chassis parameters to assist riders in holding their intended line through corners. POWER MODES: Riders can set power delivery to suit conditions and/or preference. Full power mode (100%). Low power mode limits power output to approximately 70% of full power and delivers a milder throttle response. Overall - 46.7 / 48.6 in.